Natalie Phelps Tate, M.S. Ed. To purchase the book through Amazon, follow this link. 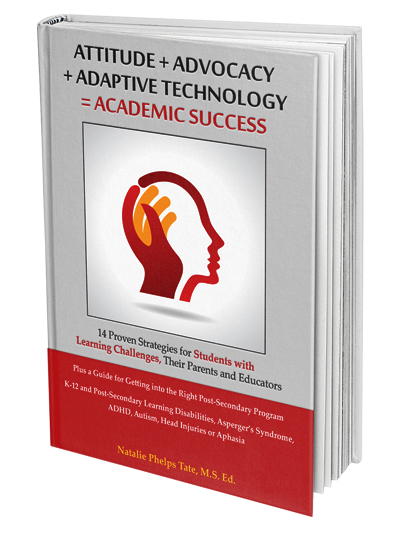 Fourteen Proven Strategies for Students with Learning Challenges describes actions, attitudes and assistive technology that will reduce educational and interpersonal struggles and stress and empower students with learning and social challenges to reach their full academic, social and emotional potential. 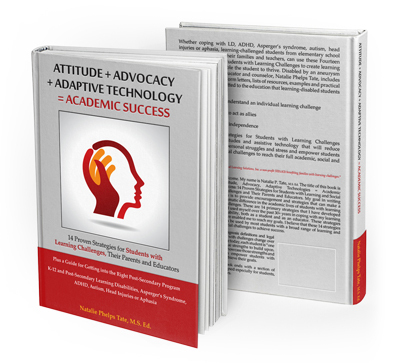 My goal in writing this is to provide encouragement and strategies that can make a dramatic difference in the academic lives of students with learning challenges. These are 14 primary strategies that I have developed and used myself over the past 30+ years in coping with my learning disability, both as a student and as an educator. These strategies have enabled me to reach my goals. I believe that these 14 strategies can be used by most students with a broad range of learning and social challenges to achieve success. Diagnosis definitions and legal classifications for students with challenges change over time. Whatever the labels are today, each student is “one of a kind” and has unique strengths to build upon. These proven strategies showcase those strengths and I believe that they can empower students with learning challenges to achieve their goals. Each chapter in this book ends with a section of additional insights designed especially for students, parents and for educators. Click to download these additional resources for more information. Strategy 8: Writing "The Letter"